To read the Canadian financial press, Bank of Canada Governor Steven Poloz "shocked" markets when he cut the policy rate on January 21. Some economists, who were still forecasting that the BoC's next move would be a rate hike in late 2015, covered their tracks by highlighting that Poloz noted that the rate cut was insurance against downside risk to the economy. These analysts seemed to imply that Poloz was just being cautious in response to an "uncertain" impact of the sharp drop in the price of crude oil. 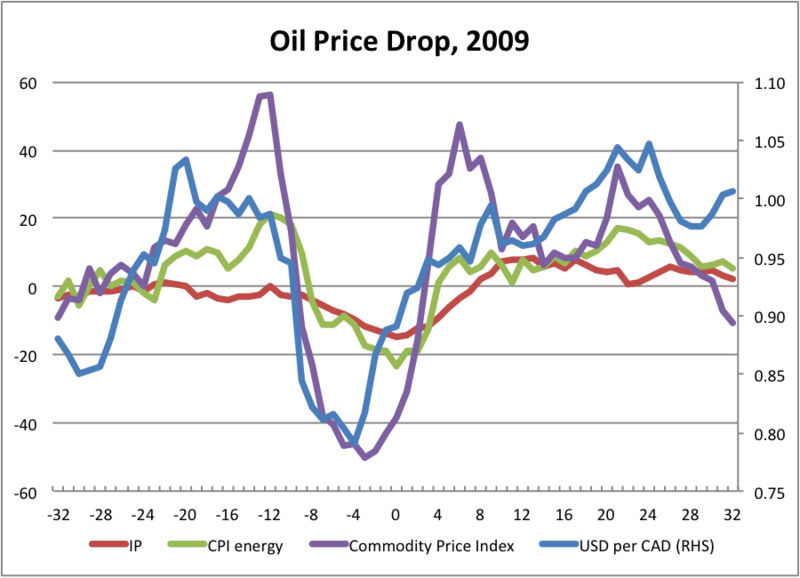 In fact, the Bank of Canada had a very good idea of what the economic impact of the drop in the crude oil price would be. The BoC's macroeconomic projection model has the acronym ToTEM, short for Terms of Trade Economic Model. The model recognizes that as a mid-sized, high-income, technologically-advanced, commodity-exporting economy, Canada's economic performance is closely tied to movements in the prices of the commodities that it exports. In the final two pages of its January Monetary Policy Report, the BoC clearly laid out its estimates of the impact that the drop in crude oil prices would have on the economy. Using the ToTEM projection model, the BoC estimated that, assuming no change in the policy rate, the drop in the crude oil price from $110/bbl to an average of $60/bbl in 2015-16 would cut real GDP by 1.4%, real consumption by 1.3%, and real investment spending by 5.2%. Forecasters can argue that they they were "shocked" because they don't have sophisticated projection models that take full account of the impact of changes in Canada's commodity prices and terms of trade. But, in my opinion, this is no excuse. 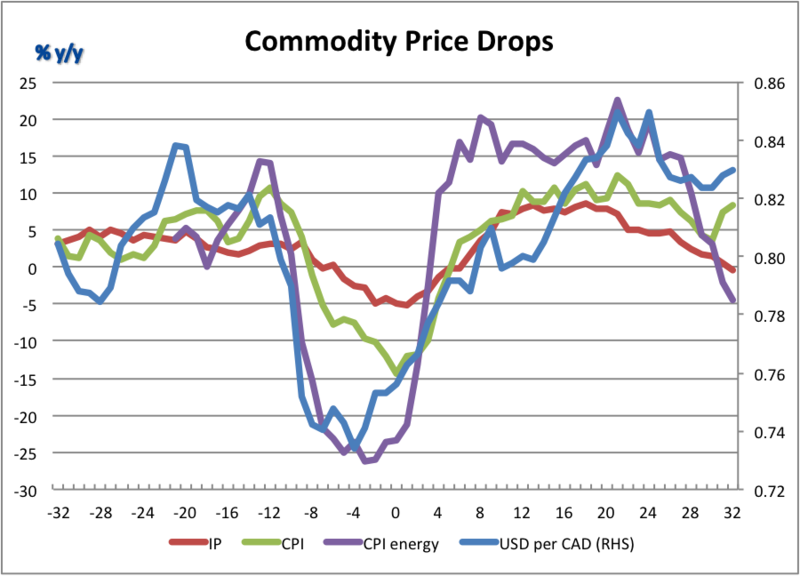 If these forecasters had carefully examined how sharp declines in Canada's commodity price index had affected the economy in the past, they should have known that a cut in the policy rate was much more appropriate and much more likely than a rate hike. The chart below shows the main indicators of Canada's current massive negative commodity price shock. 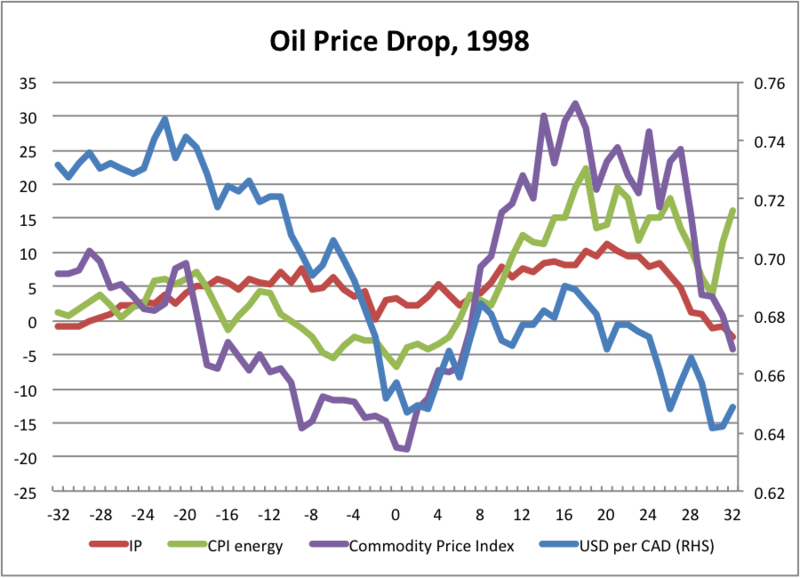 While energy prices, which have a weight of just under 50% in the commodity price index, are the current focus of attention, it is worth noting that Canada's non-energy commodity prices have fallen about 16% since hitting their all-time high in April 2011. The horizontal scale shows the number of months before and after crude oil and gasoline prices hit their low point. The commodity price index was down almost 40% from a year earlier in January 2015. Gasoline prices, reflecting the sharp drop in crude oil prices, were down almost 30% from a year ago, implying a drop of about 15% in the CPI for energy products. Industrial production (IP) was only available through November 2014, when it was up 2.1% from a year earlier. The debate in early January, before the BoC cut the policy rate, was about what impact the sharp drop in the price of crude oil would have on Canadian inflation and growth. Most forecasters had not fully factored in impact the the drop in the price of gasoline would have on the total inflation rate. And almost none of the forecasters had factored in any significant impact on growth. What Happened in Previous Commodity Price Shocks? 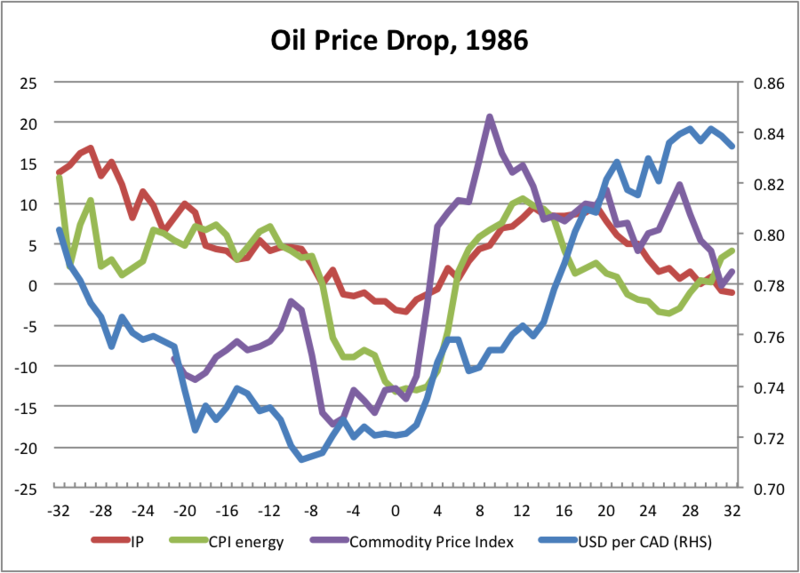 The current period is not the first time that Canada's commodity price index has collapsed. There have been three previous occurrences in the past 30 years. What happened to growth, inflation and the Canadian dollar in those periods? The chart below shows how the indicators performed on average during three similar shocks in the past. As in the chart above, the horizontal scale shows the number of months before and after crude oil, gasoline prices, and the CPI for energy hit their low point. The three previous commodity price shocks occurred in 1986, 1998 and 2008-09. The chart shows that on average, the commodity price index fell about 25% y/y at the low point of these shocks. The CPI energy fell 15% y/y on average at its' low point, mainly reflecting lower crude oil and gasoline prices. The Canadian dollar depreciated about 12% from its peak on average. The key is what happened to industrial production: on average it fell 5% y/y, with the low point occurring around the same time or shortly after crude oil and gasoline prices hit their lows. In all three previous commodity price collapses, the Bank of Canada cut its policy rate. Why was it a "shock" to forecasters that the BoC cut again in January? Why did Poloz take out insurance? Because as history tells us, and as the the ToTEM model projected, there was a very high risk of not only a sharp drop in inflation, but also a sharp drop in growth. Did the 25 basis point policy rate cut buy enough insurance? Not likely. 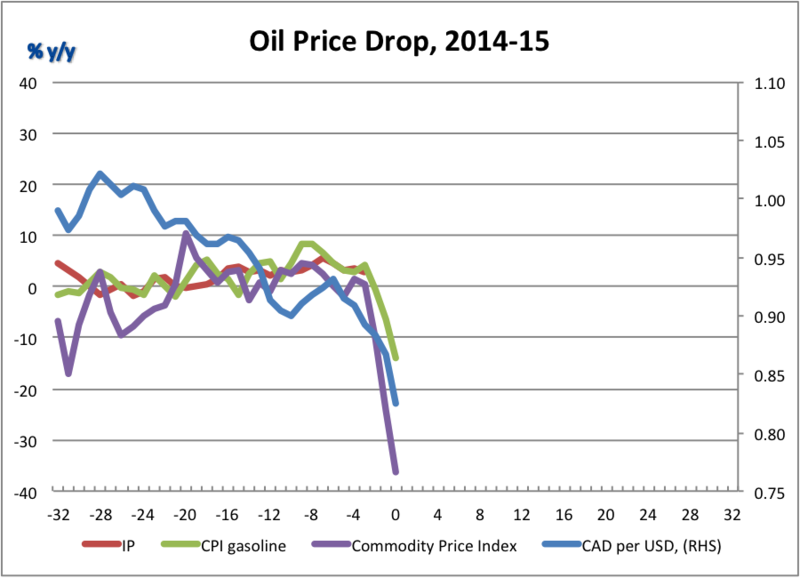 The BoC's January projection assumed that the price of crude oil would average $60/bbl over 2015-16. As Poloz noted in January, "Obviously, [the downside] risks would be even more material if oil were to average $50 a barrel". A mere 25 basis point rate cut is unlikely to mitigate significantly the impact of one of the biggest commodity price collapses of the past three decades. For those who want to study each of the three previous commodity price collapses in more detail, individual charts for 1986, 1998 and 2009 are shown below.